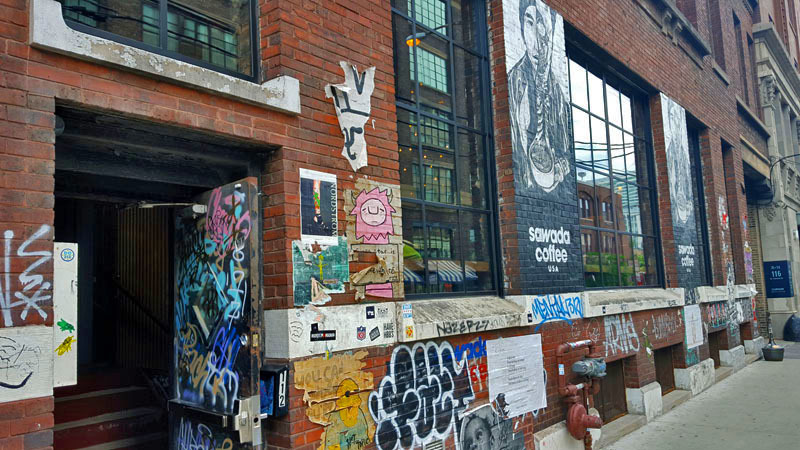 Chicago and its coffee scene has been on the mind a lot lately. Its been a minute since I last experienced. A coffee drink that is near the forefront of my thoughts is the Instagram friendly and visually appealing Military Latte. 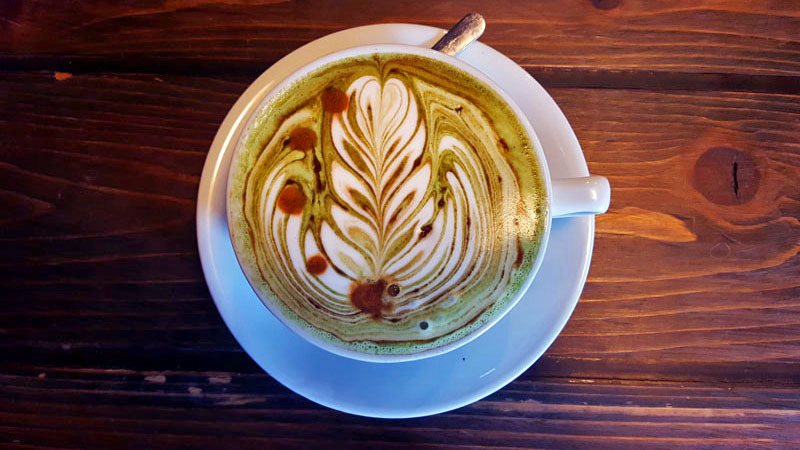 The Military Latte is the creation of Sawada Coffee. 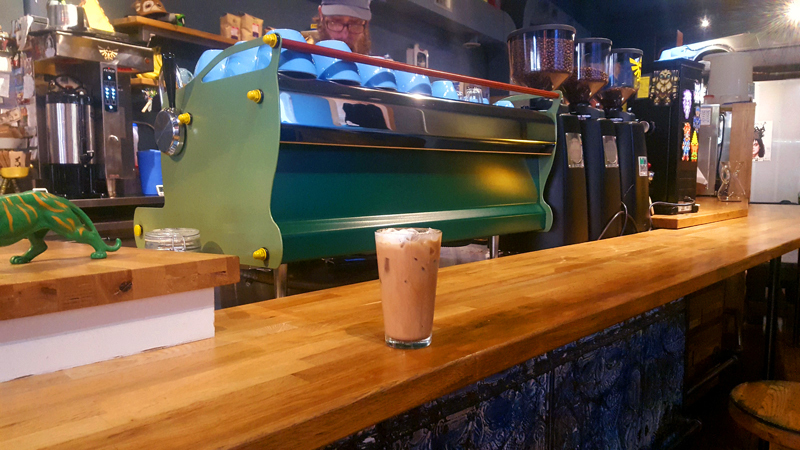 I got my first experience of the West Loop neighborhood coffee gem on my most recent personal Chicago coffee crawl. 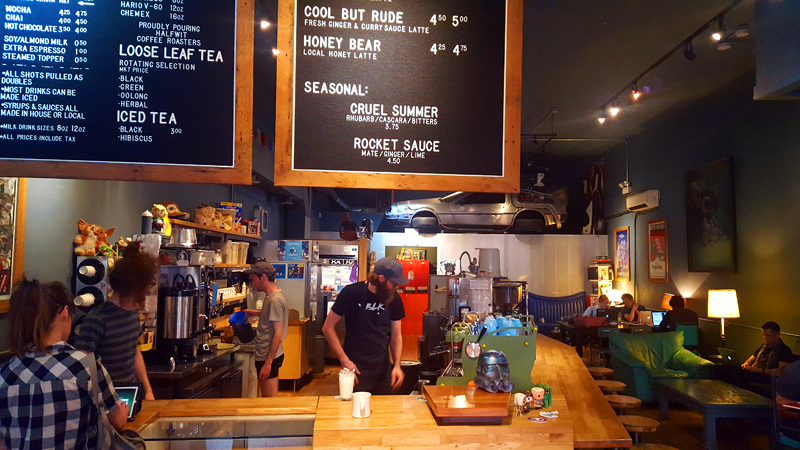 On an early morning I entered Sawada Coffee off North Green Street. 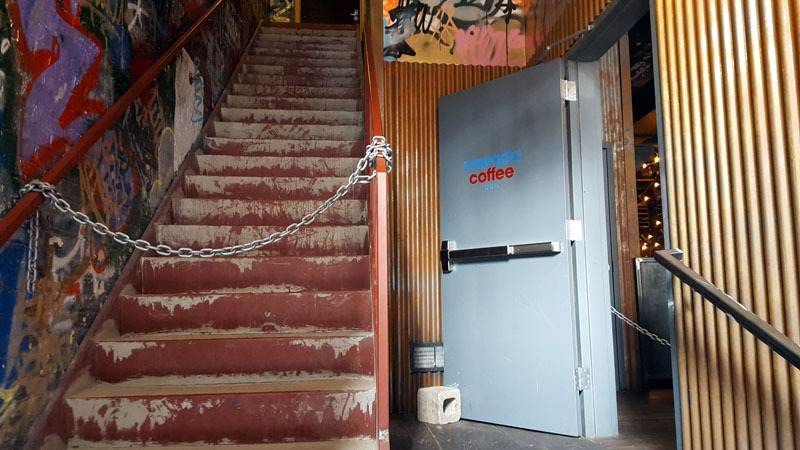 I headed up a darken set of stairs that sat in the back of Hogsalt Hospitality’s Green Street Smoked Meats, for which this coffee shop is a part of. It’s kind of ironic that green is in the name of the restaurant. 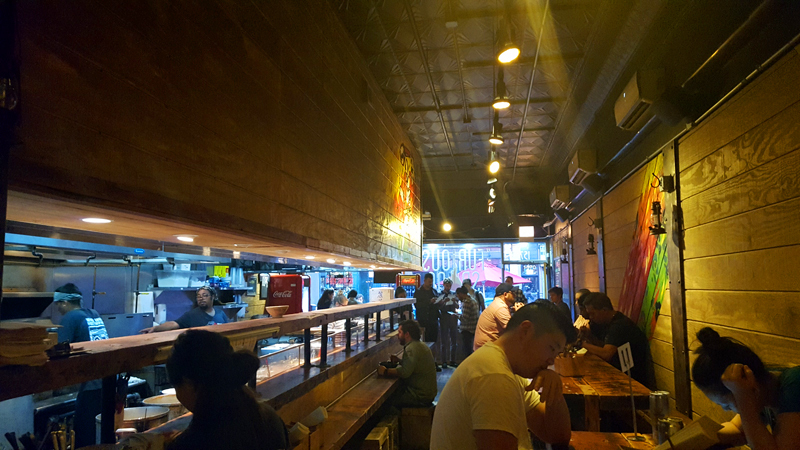 It was a happening West Loop scene as I waited my time to order from the true Americana themed counter. 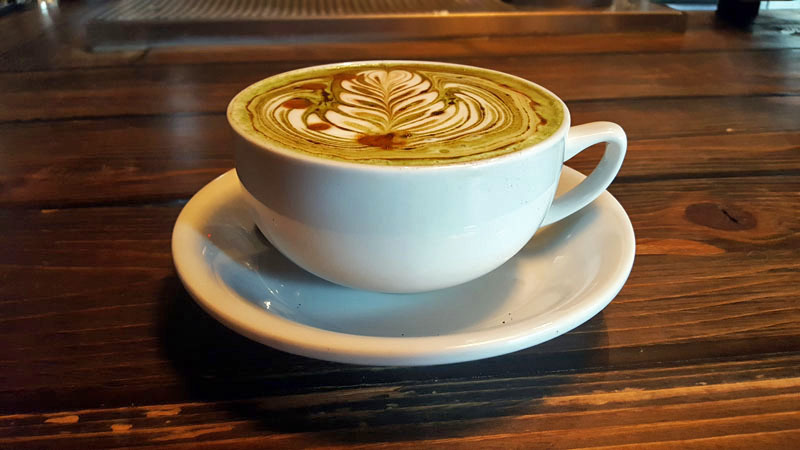 Sawada offers a variety of pour overs, other lattes, chais and espresso drinks. Those things hardly registered with me at the time though as it was going to be the Military Latte all the way. 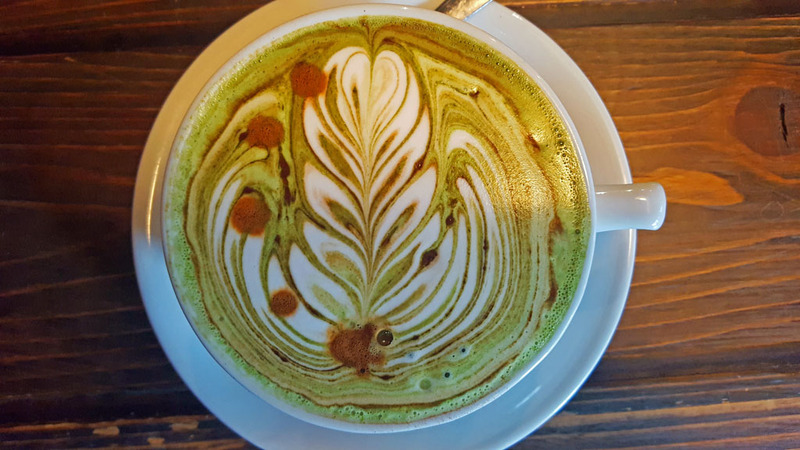 Tea-based latte? Coffee-based latte? How about both. Espresso and matcha working together. Add some vanilla syrup for sweetness, cocoa powder and with the green tea sitting amongst the foam you had a coffee presentation unmatched in the city. Back to the word green it is! I enjoyed the unique goodness amongst all the twinkling lights hanging from the ceiling in the aesthetically pleasing coffee shop. 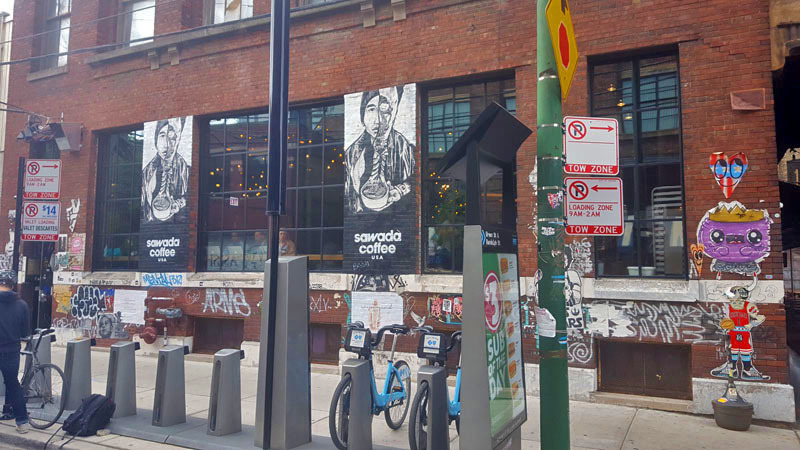 Sawada is named after its founder Hiroshi Sawada who also owns five coffee chops in Japan (making note) and is a World Champion Latte artist. I can easily see why. The Military Latte is not all looks though. It has all the substance and the unique flavor one could only want in a latte. I sipped slowly after my photo shoot. No worries I did drink it hot! 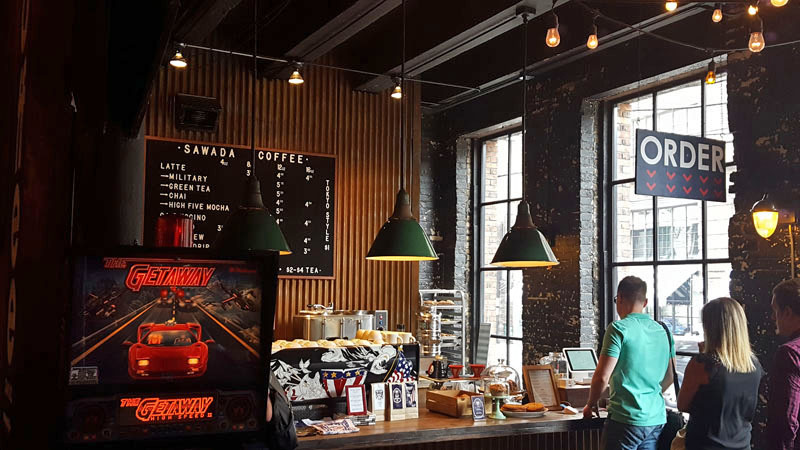 I look forward to getting back to Sawada Coffee, other favorite spots and exploring more of the Chicago coffee scene again soon. Military Latte cheers to all! You can find Sawada Coffee on Instagram. 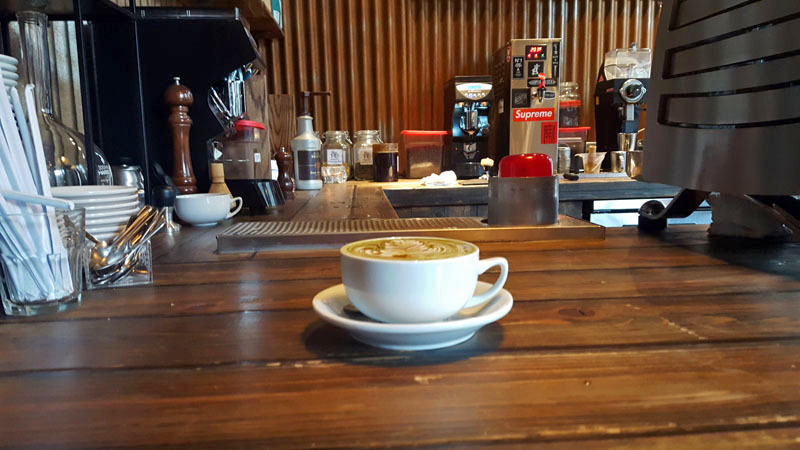 Which Chicago coffee shops do you have fond memories of and would recommend checking out? The 2016 Coffee Moment(s) for Me. The year ib coffee is highlighted in a short video snippet. The background song is the appropriately named “Coffee Shop” by Gorilla Zoe. 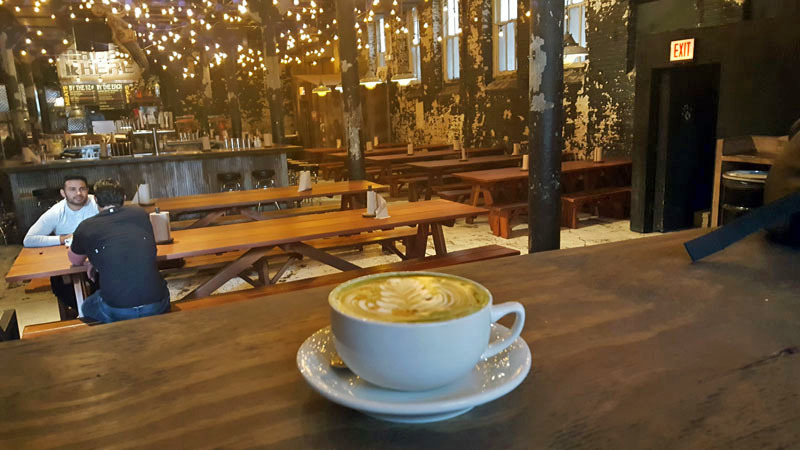 The cover photo is a Military Latte from Sawada Coffee in Chicago’s West Loop neighborhood. I would easily say this is my favorite coffee drink and moment of the year. 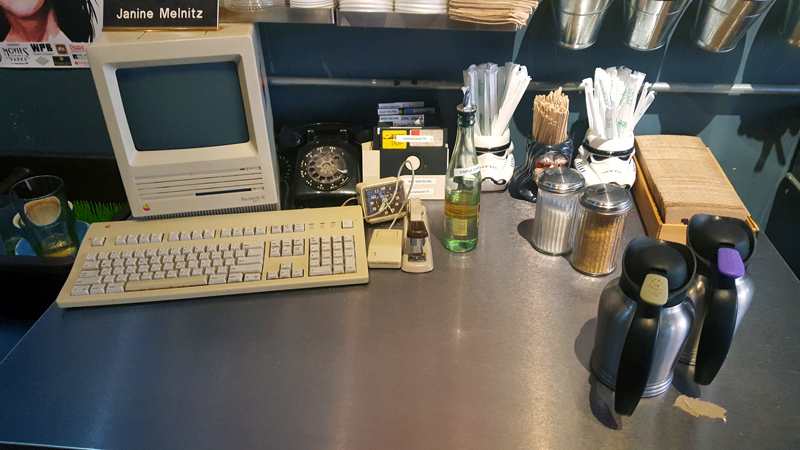 Check out the great coffee moments from last year in The 2015 Coffee Moment(s) for Me. 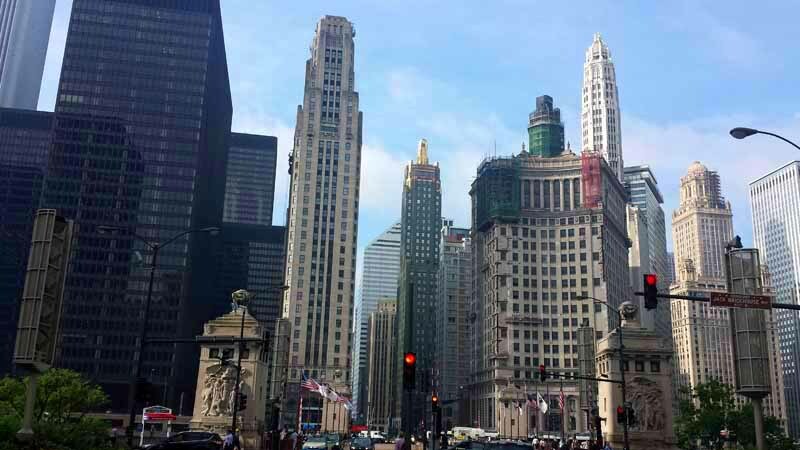 Chicago: A Million More Skyline Looks. 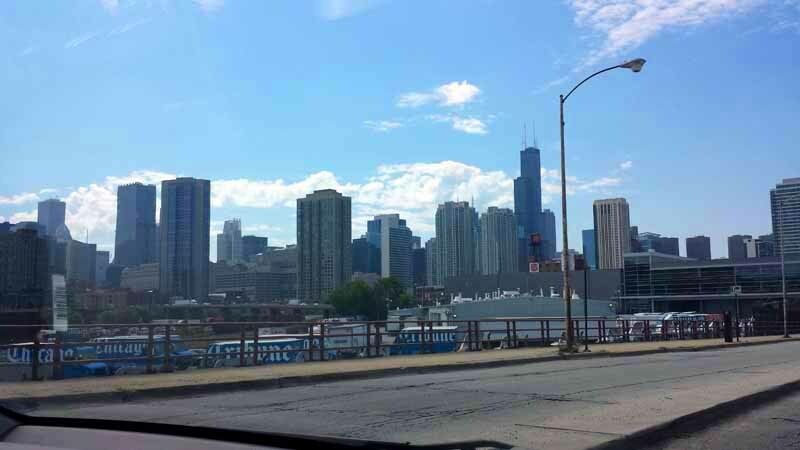 I’ve made it no secret through this blog and on Twitter and Instagram that I love the Chicago skyline. 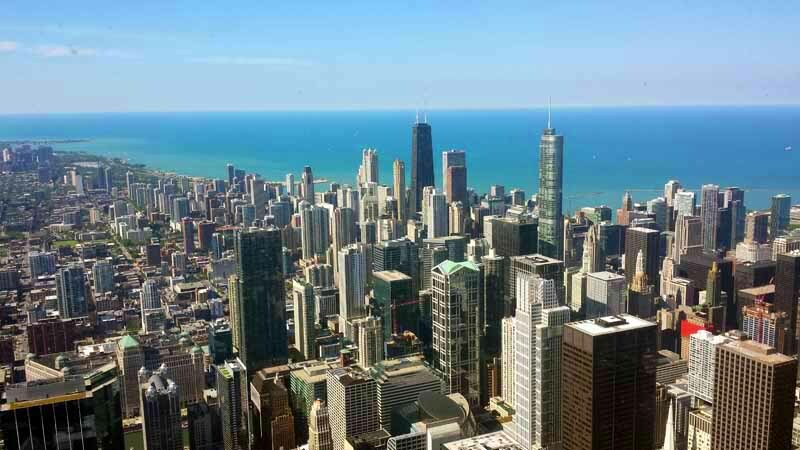 The Windy City was highlighted in my ongoing A Million Skyline Looks series earlier in the year. 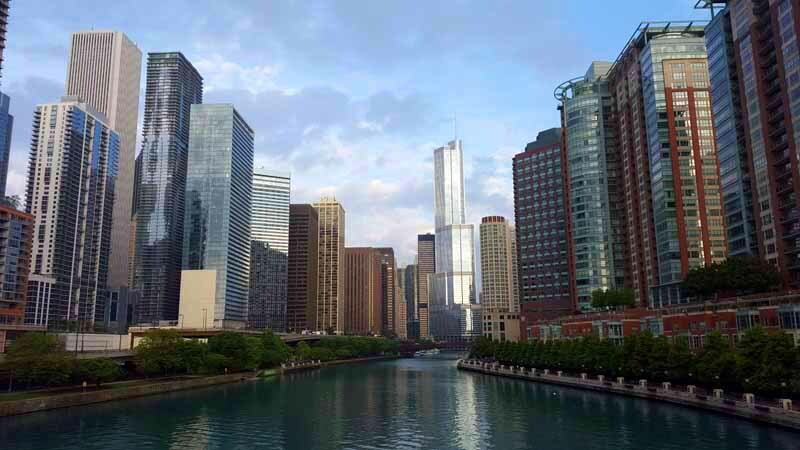 Michigan Avenue at the Chicago River, enough said. 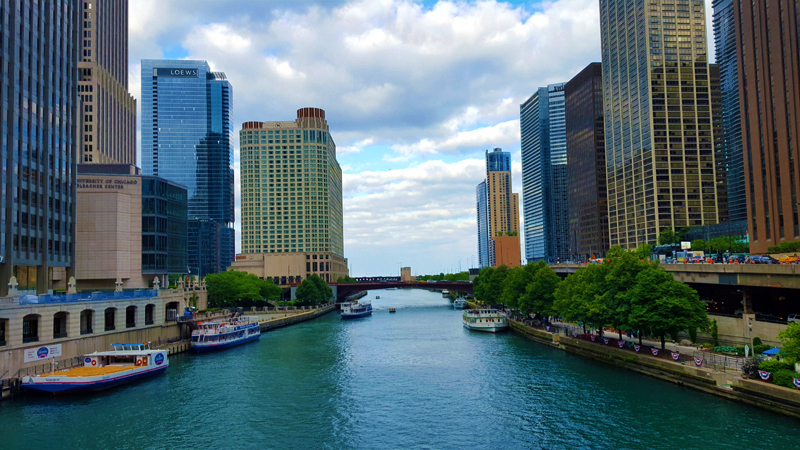 Looking down the Chicago River towards Lake Michigan, between all the tall buildings. 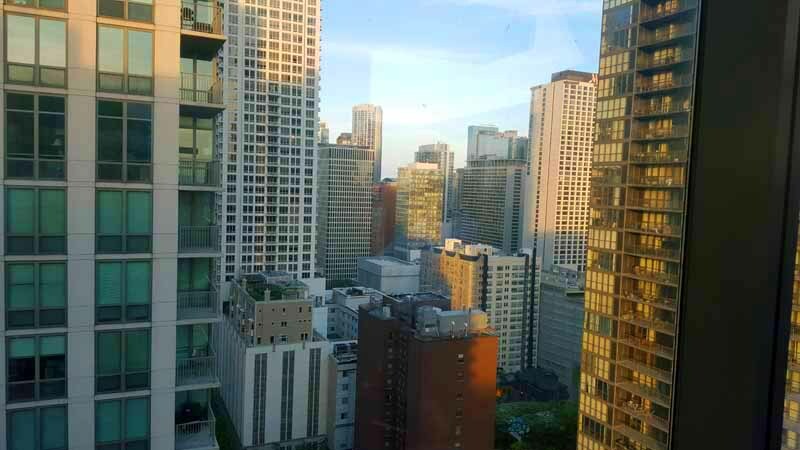 Looking at all the skyscrapers due north from up-top Hyatt Regency Chicago. 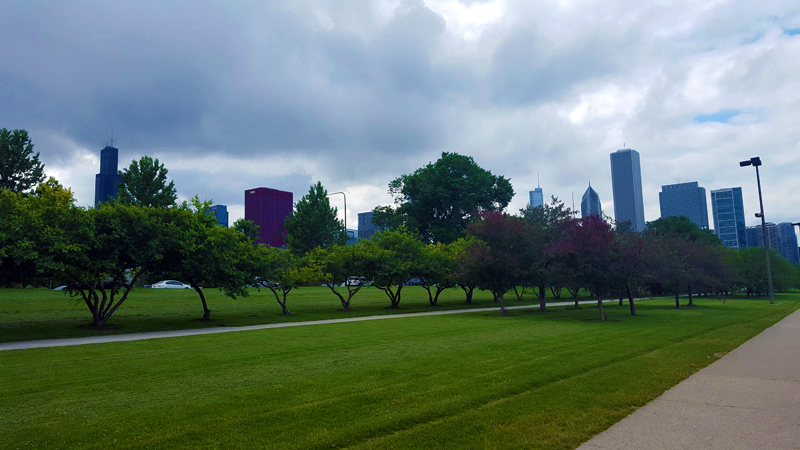 Plenty of cityscape awaits the visitors of Grant Park. 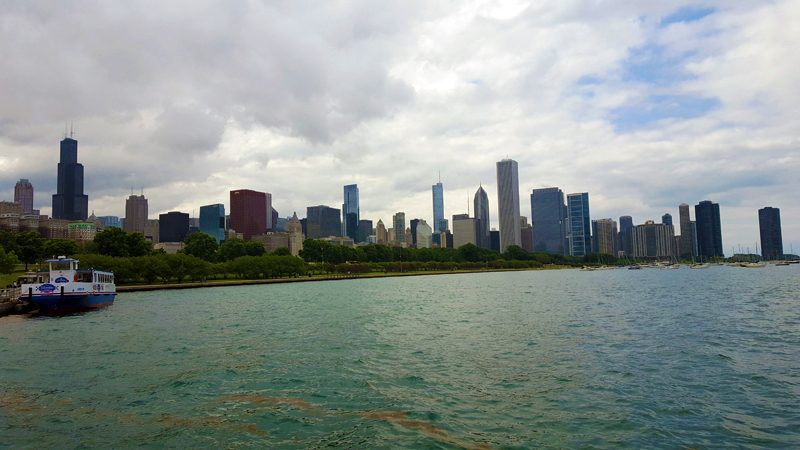 Chicago skyline from alongside Adler Planetarium and Lake Michigan. There you are whenever I need you Willis Tower from Grant Park. 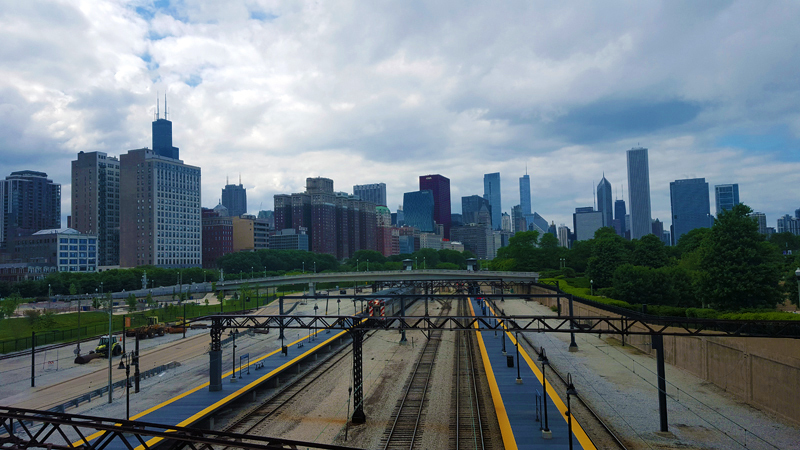 Looking straight towards Chicago Union Station. Where are you Amtrak? 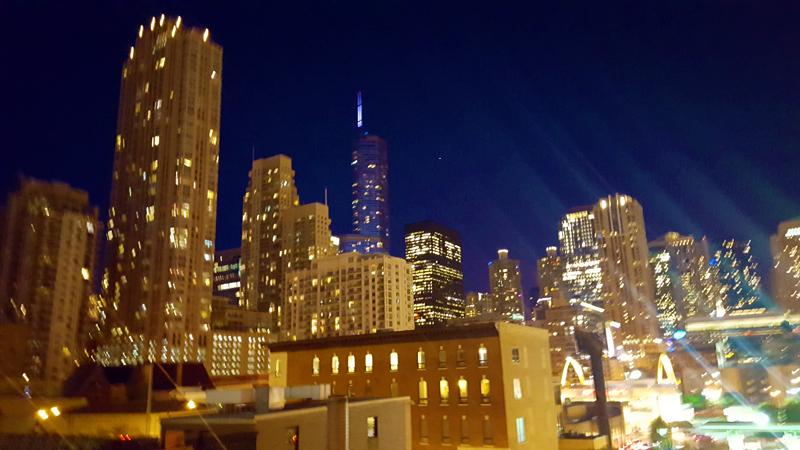 Enjoying the night-time city views from up-top The Godfrey Hotel in the North Loop. 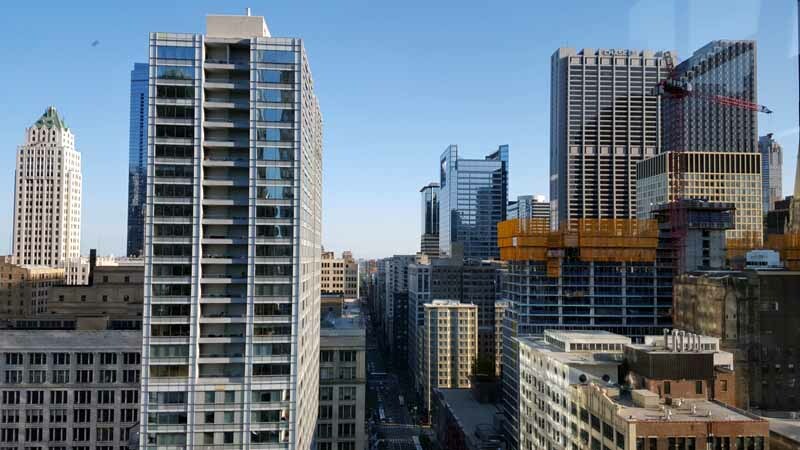 The Godfrey Hotel rooftop in the North Loop. 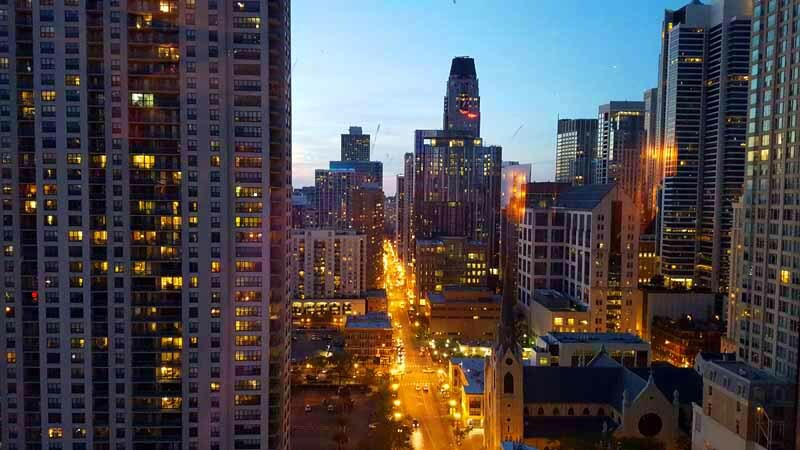 Hanging out at the Vertigo Sky Lounge brings with it city views in all directions. 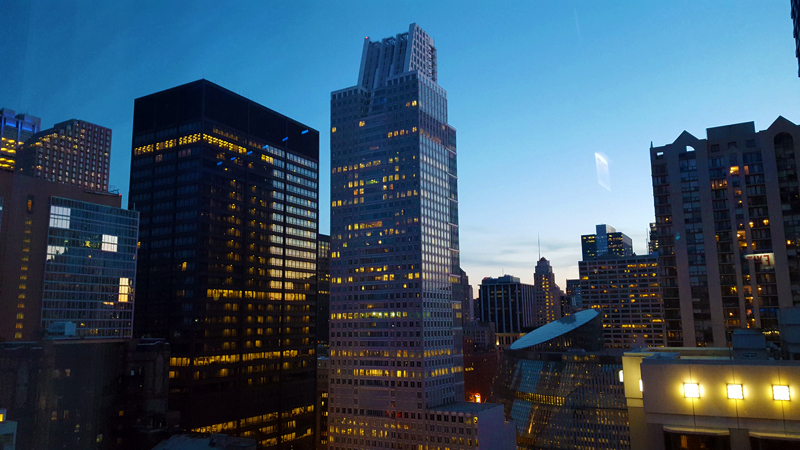 Dusk up-top the Dana Hotel & Spa at Vertigo Sky Lounge. 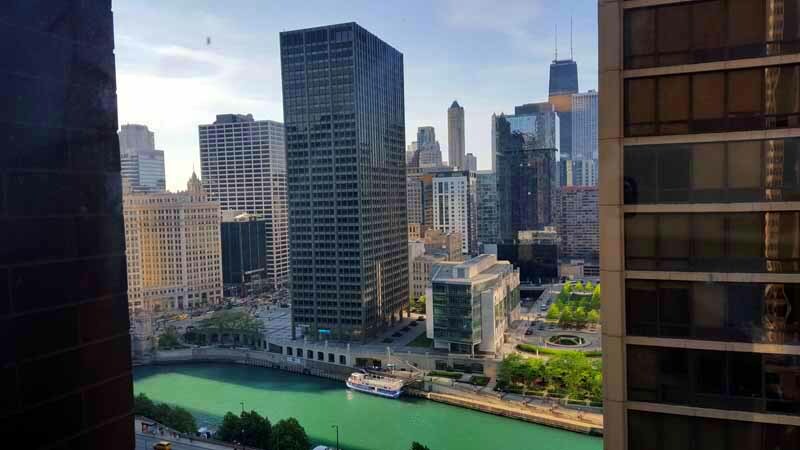 The 26th Floor and Vertigo Sky Lounge equals lots of Chicago skyline beauty. 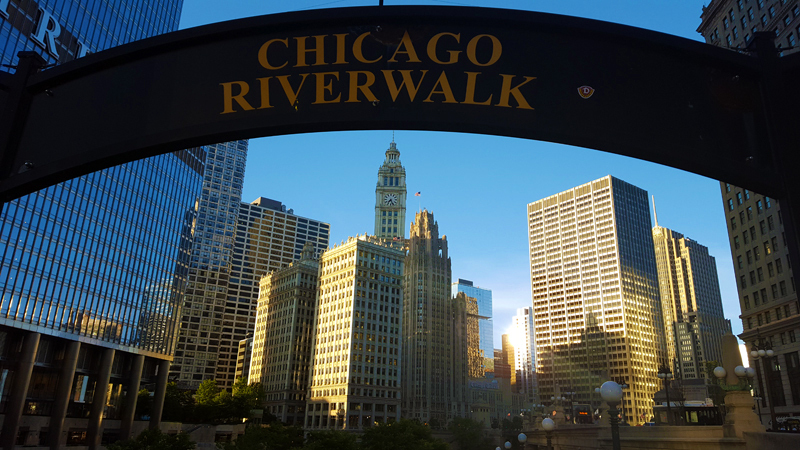 The Chicago Riverfront brings with it beautiful city views. 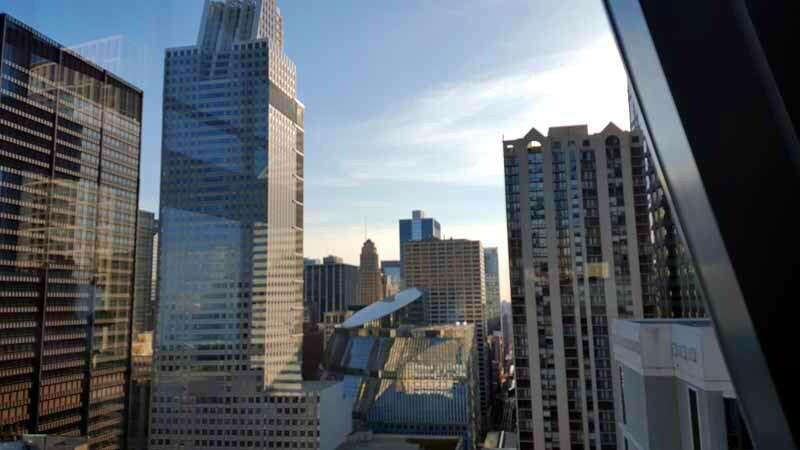 Looking to the south from up-top Hyatt Regency Chicago. 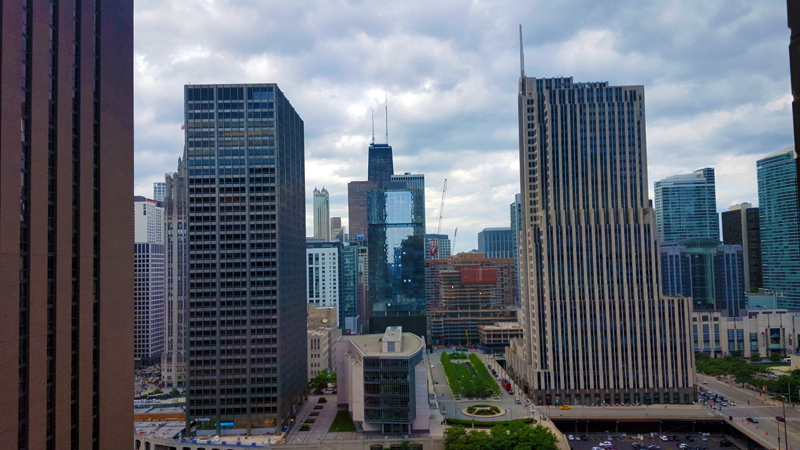 Besides capturing the vastness of the city on this trip I decided to play a little peekaboo with the Sears, I mean, Willis Tower. It always seems to be in view. A great navigational tool in fact if you ever get lost. 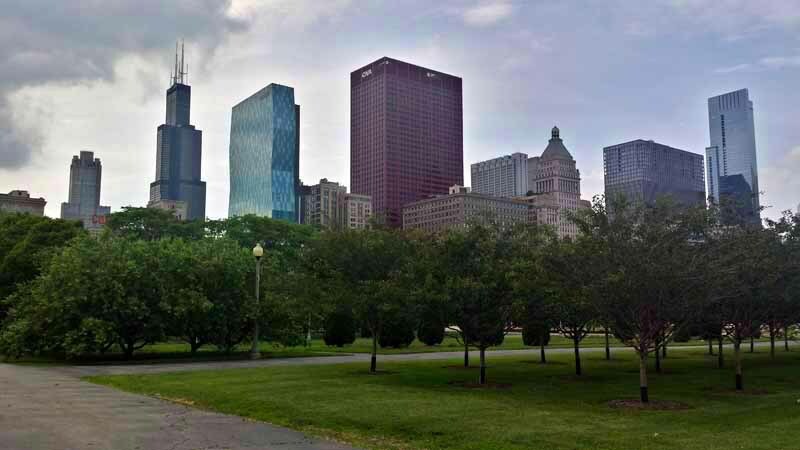 The skyline is always making its presence known within Grant Park. 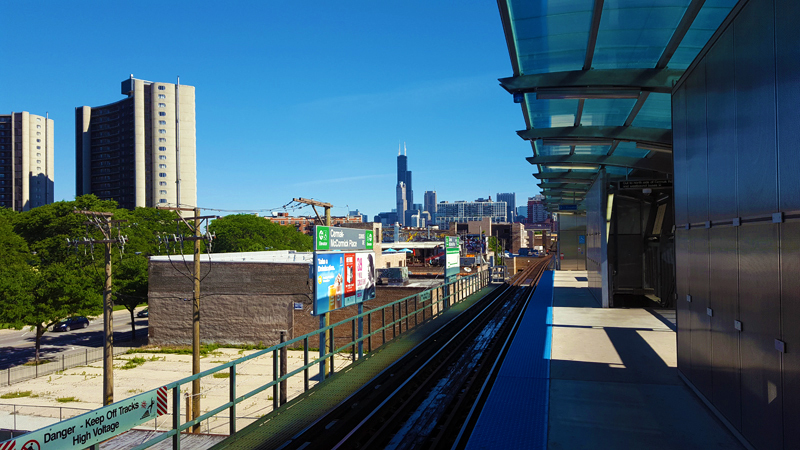 The Willis Tower and skyline are standing tall from the Green Line in South Loop. 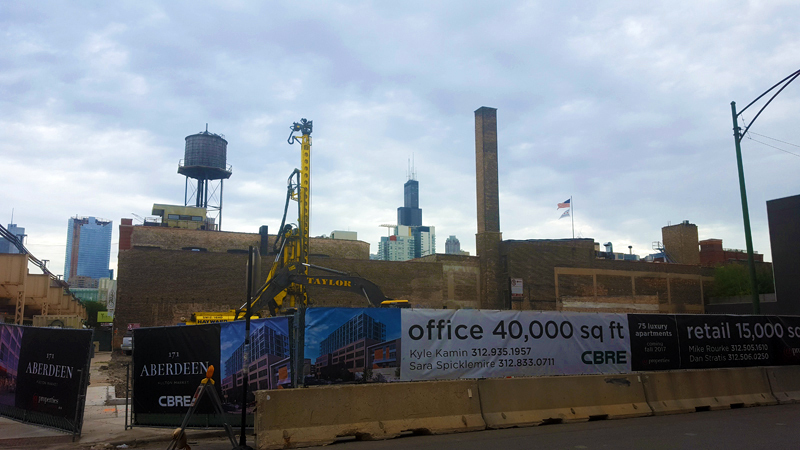 Sears, I mean, Willis Tower is playing peekaboo along Michigan Avenue. 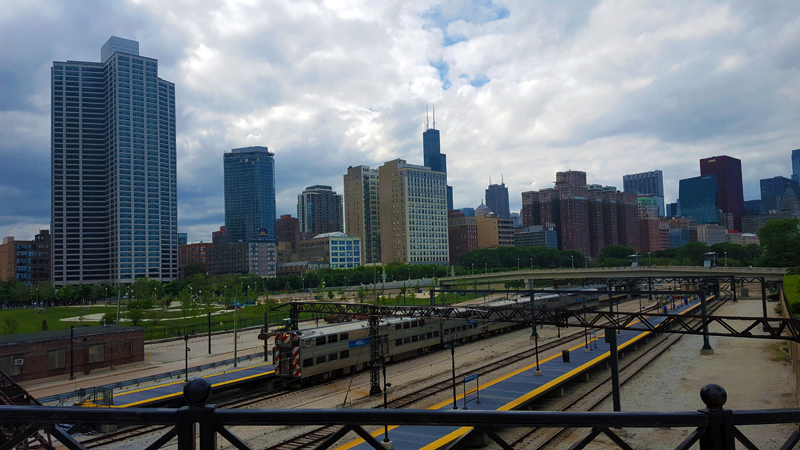 Enjoying the skyline view as I await the Green Line train in West Loop. 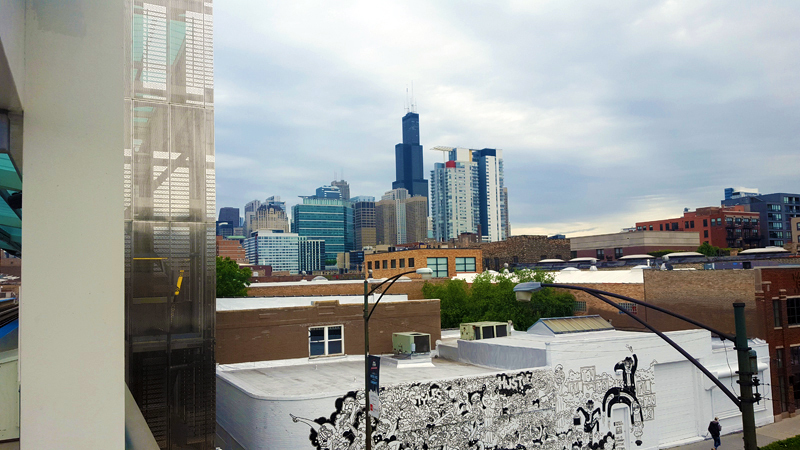 Willis Tower is standing tall from West Loop. 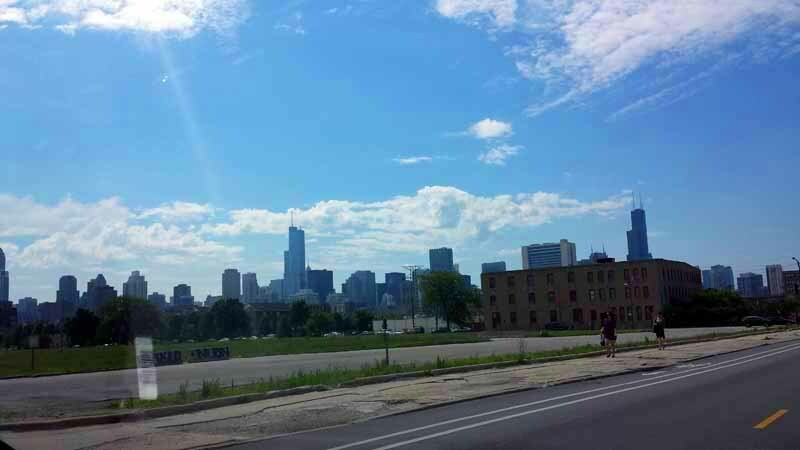 You can see the Willis Tower is everywhere. 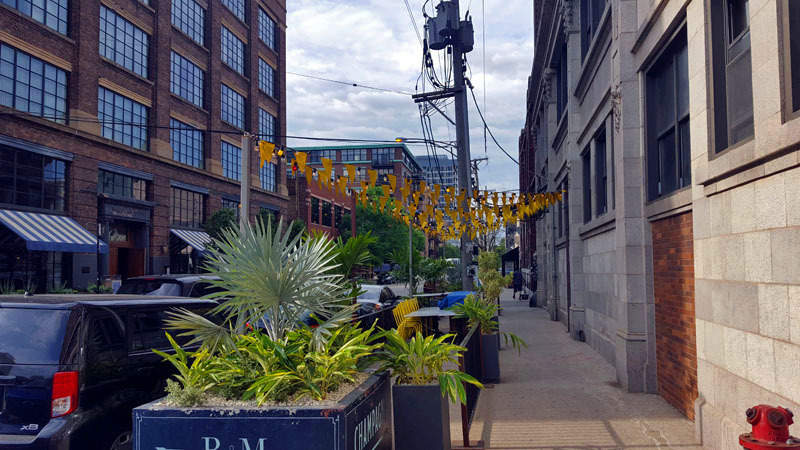 Walking along West Randolph in West Loop. 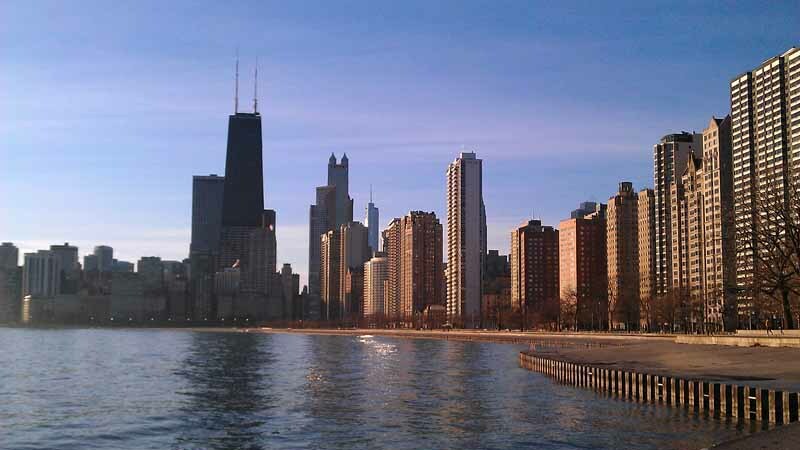 Where do you like to capture the Chicago skyline from? 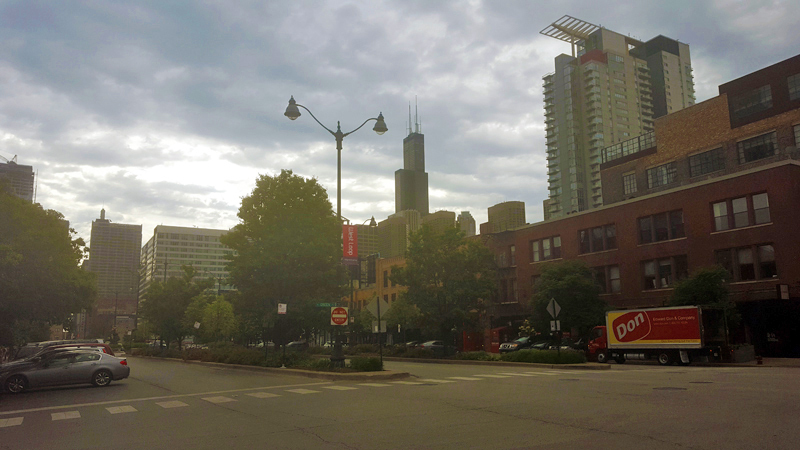 On a recent trip to Chicago, I was going to meet up with a friend who lives in the Wicker Park neighborhood. 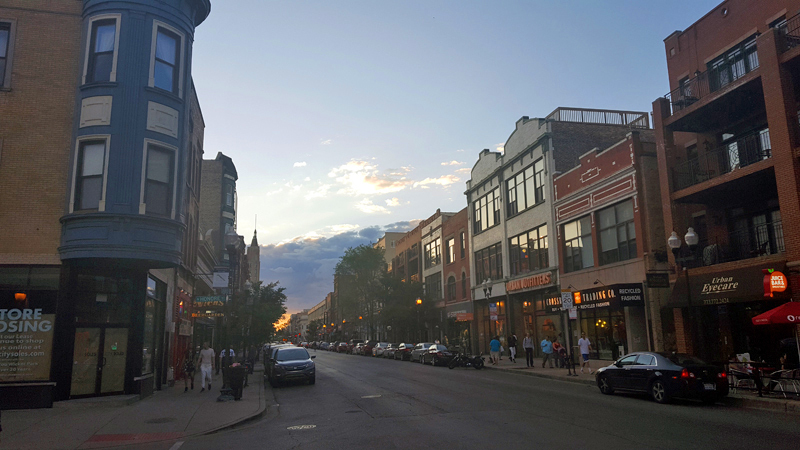 Wicker Park is known as being the hipster part of town and a great place to hang out at night. 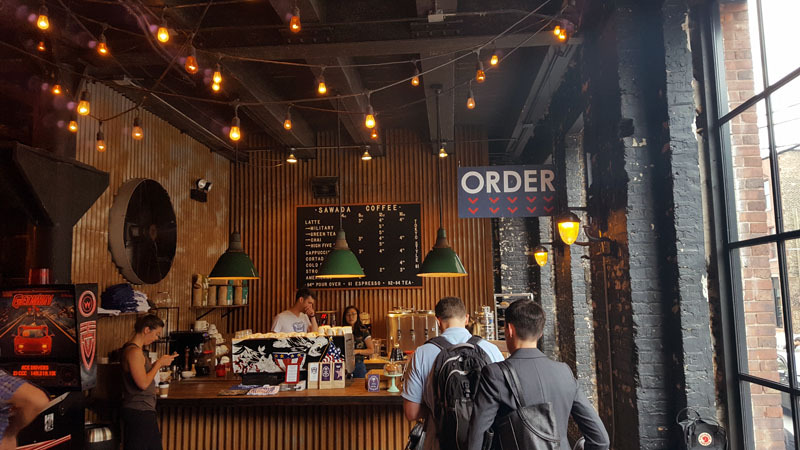 Its gained steam as a food destination with restaurants and independent coffee shops springing up like hot cakes. I decided to make a longer foodie evening of it and soak some of that atmosphere in. I hopped on the Blue Line “L” train in The Loop along with the masses getting off work and headed towards the northwest. A little bit later it seemed like half the train got off with me at the Damen station in the heart of neighborhood. What a happening place. Since I don’t usually follow eating conventions, I’ll eat pizza for breakfast, I decided to begin with dessert. 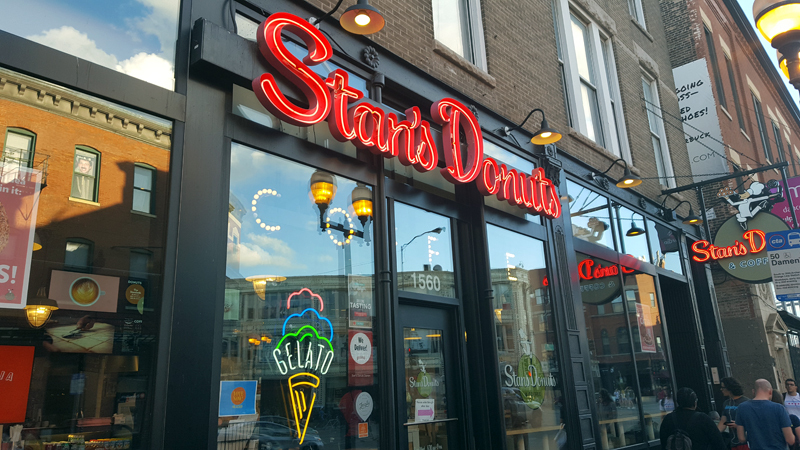 Just outside the train station entrance my feet took me into Stan’s Donuts on Damen. 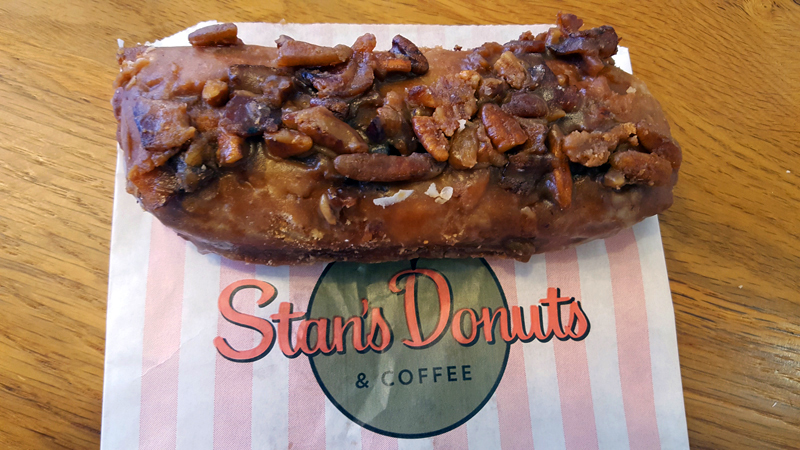 Starting in Los Angeles more than fifty years ago, Stan’s is a gourmet donut institution that has spread to several locations in the Windy City. 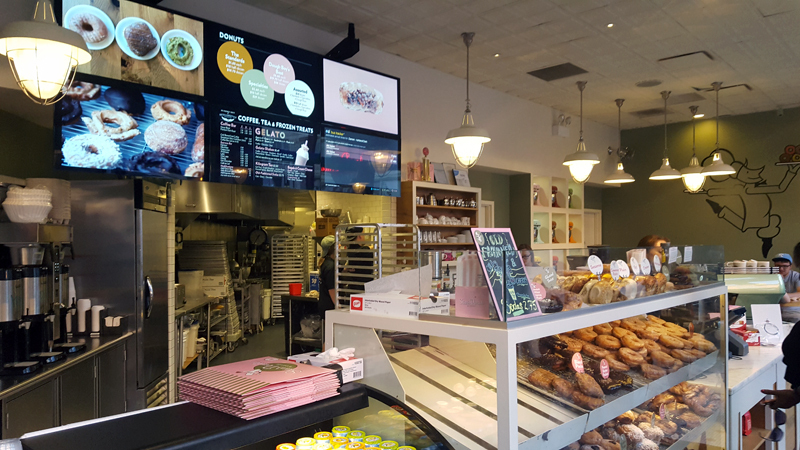 Having spent only mornings in Wicker Park in the past, I’ve seen one endless line after another, with everyone grabbing pastries and coffee before hopping on the “L” to get to work. Being it was the evening this time there was no line score! 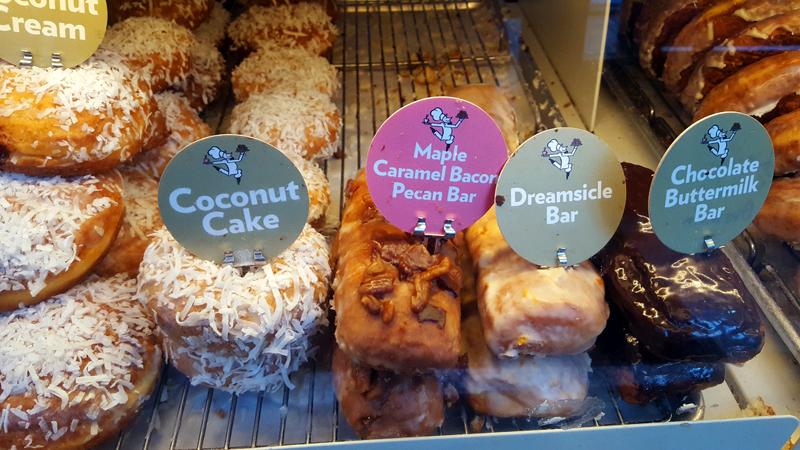 Upon entering I saw the donuts in the display case. The gourmet one with the longest name immediately caught the eye. Hey, the more words in its name, the more goodness it must have in it right?! I enjoyed a Maple Caramel Bacon Pecan Bar amongst the retro decor. Wait nothing to wash it down with? I was saving that for my next stop. 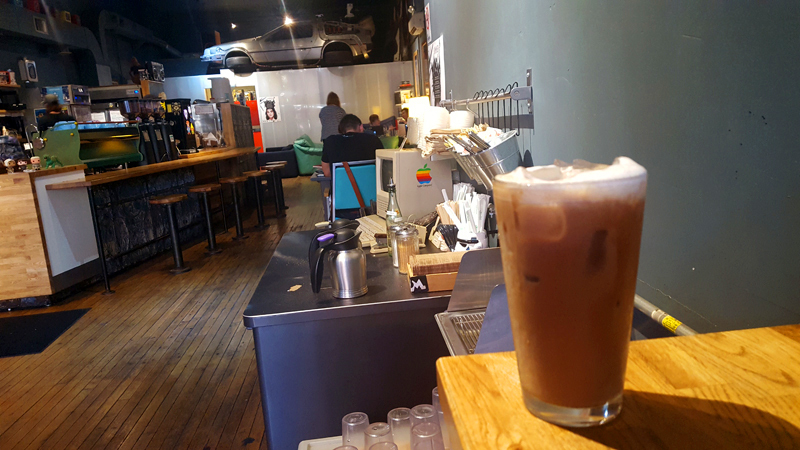 A short walk down W. Milwaukee Avenue, the main street of Wicker Park, brought me to my favorite coffee shop in the city and arguably anywhere, The Wormhole Coffee. I entered the sci-fi themed coffee shop already knowing what I was craving, a Peanut Butter Koopa Troopa latte. I sat next to an Apple II computer bringing back memories of childhood, while listening to one Depeche Mode song after another. That brought back memories of road trips pasts. I was in heaven. Of course I had to say hi again to the Back to the Future style DeLorean that sits in back. It was time to meet up with my friend, who recently moved here from Michigan. He gave me some choices on places where we could grab some dinner. Dessert first, then a specialty coffee, with the main course last, that is indeed how I like to roll! Burgers, pizza and ramen noodles were the choices. I thought to myself I eat the first two things a lot, so let’s go with ramen. We hit up Furious Spoon and both ordered the Shoyu Ramen. 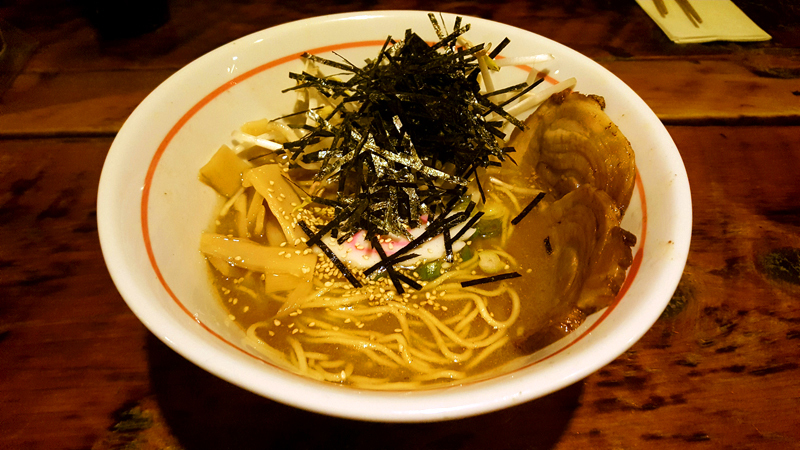 Fresh ramen noodles made in-house mixed in with Chashu pork belly, bamboo, bean sprouts and more foodie goodness. 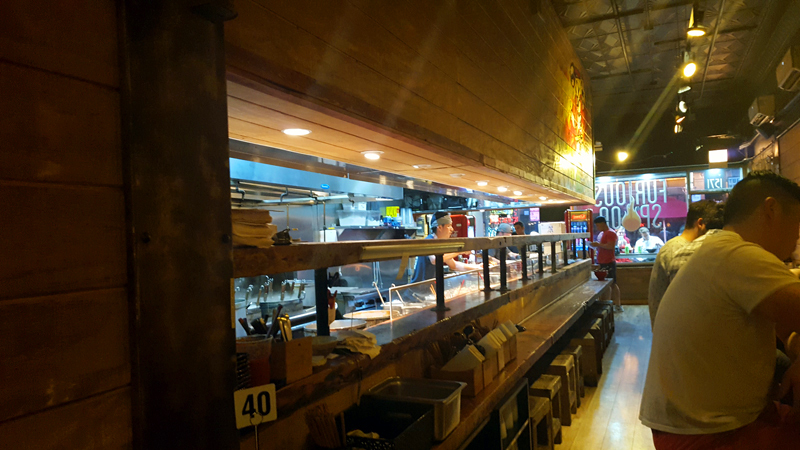 The outside seating along Milwaukee was full, so we hung out and caught up at a long, wooden communal table alongside the open kitchen. I thought to myself, what a great place to hang out after a long day. That was my first time dining in an authentic ramen restaurant. What took so long? 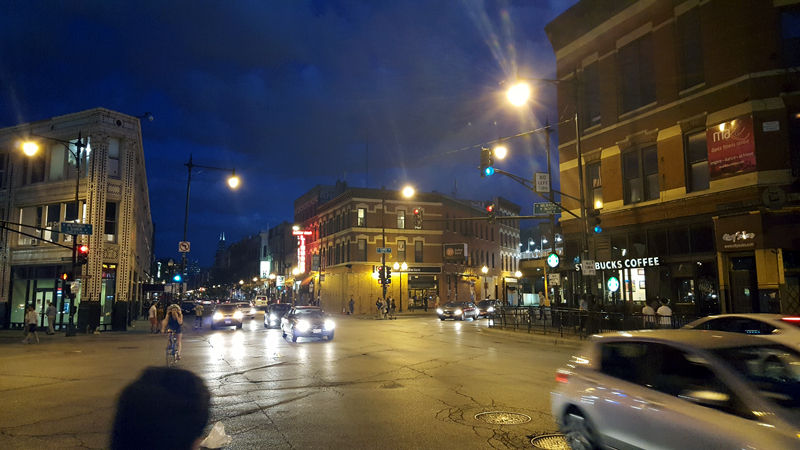 I continued to get my first taste of Wicker Park at night as we walked some of the neighborhood afterwards before calling it a night. It was a quick, but memorable evening of treats and food in one of Chicago’s more popular neighborhoods. All the other establishments and outside seating we walked by makes me want to experience more of it on another trip soon. 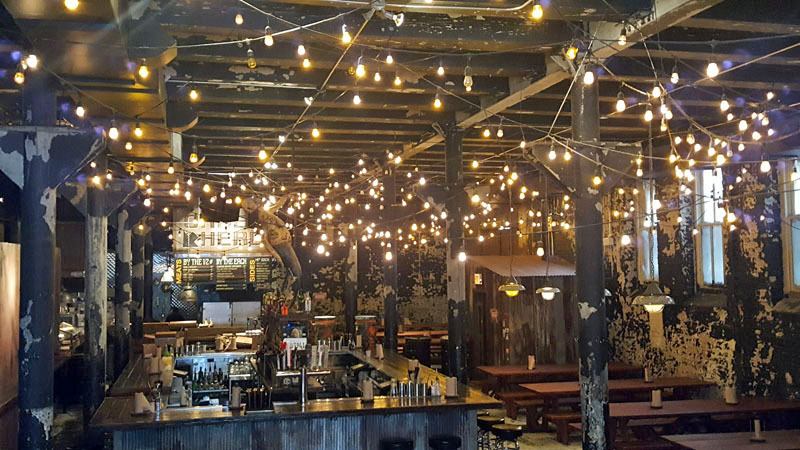 What other food and coffee spots would you recommend checking out in the Wicker Park part of Chicago? 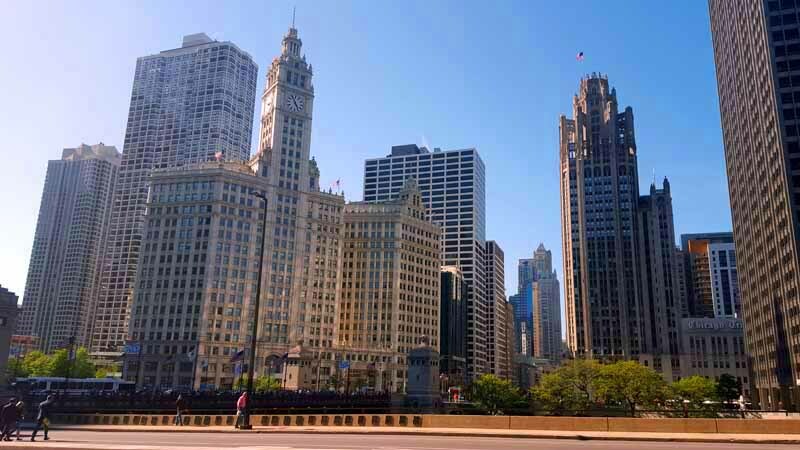 Chicago: A Million Skyline Looks. A while back I posted Toronto: A Million Skyline Looks, which highlighted some of my favorite shots in Canada’s biggest city. I recently re-read the post and it inspired me to start a series of posts highlighting what my camera has shot while hanging out in a big city. 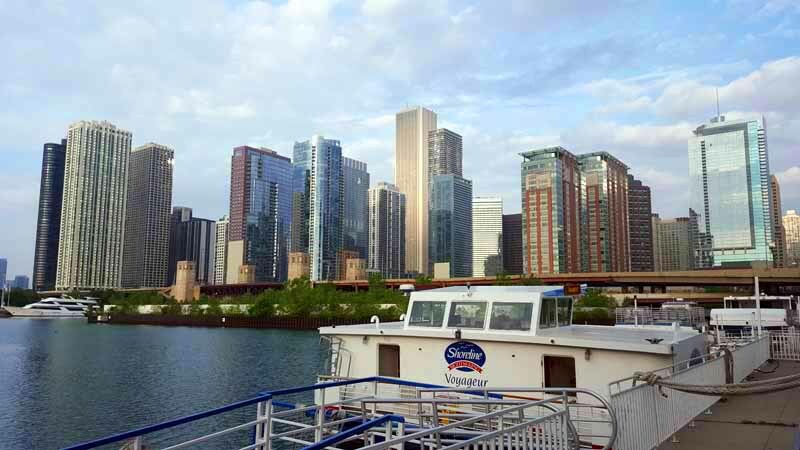 Next up the Windy City and the million skyline looks it has to offer! 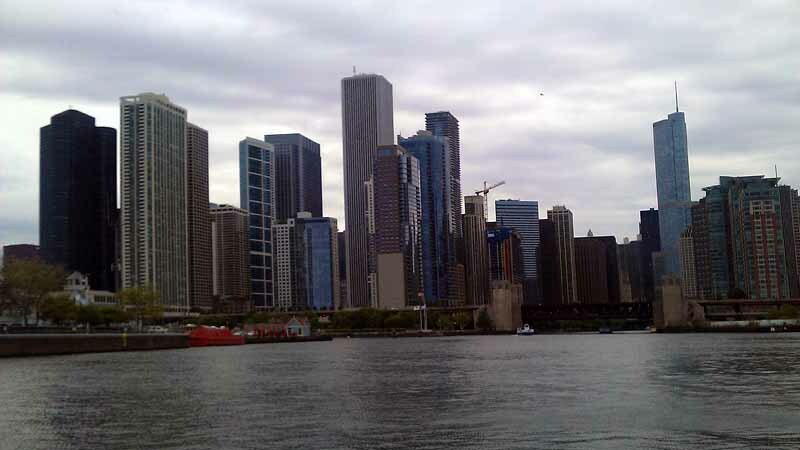 Always keep an eye on Chicago’s tall buildings when along the water. 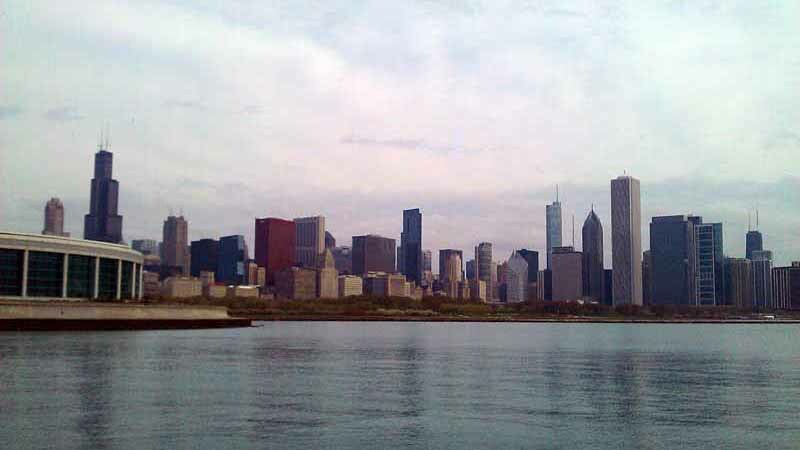 The city view from Shedd Auditorium opposite Lake Michigan. 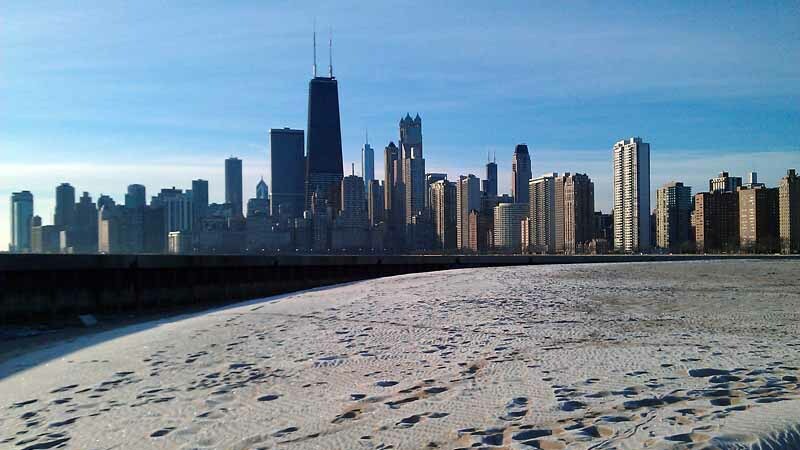 The panoramic skyline sits beyond the morning snow and frost of North Street Beach. Looking south from North Street Beach. 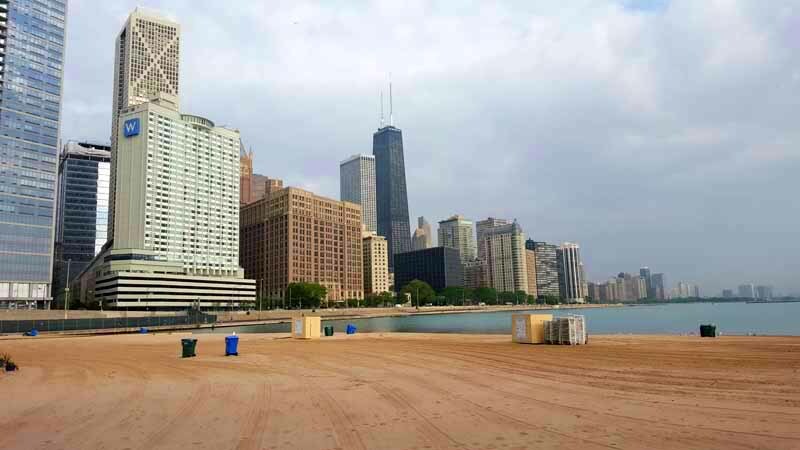 Sand, lake and skyline from Ohio Street Beach. 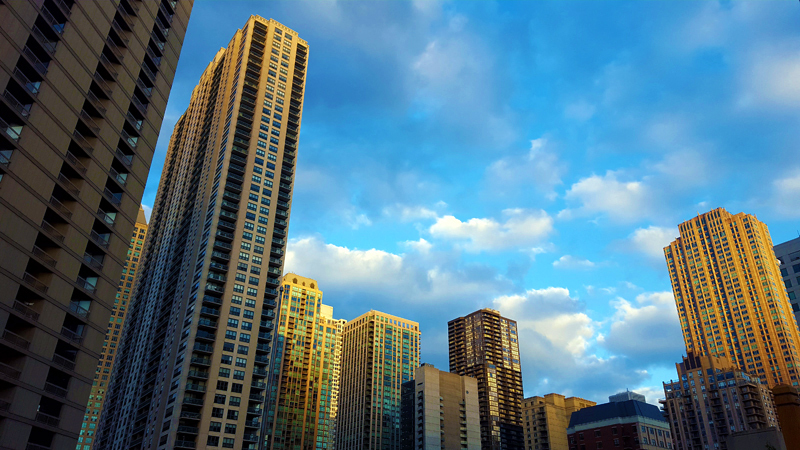 Skyline views await walking either side of Navy Pier. 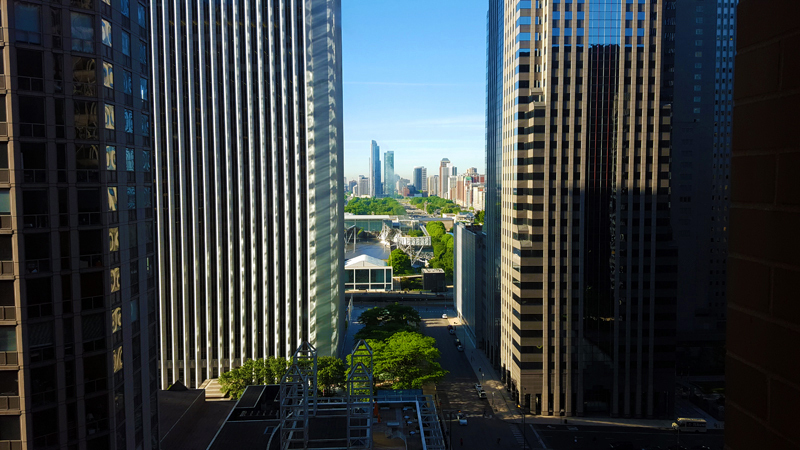 Looking west from N. Lake Shore Drive at the buildings that line both sides of the Chicago River. 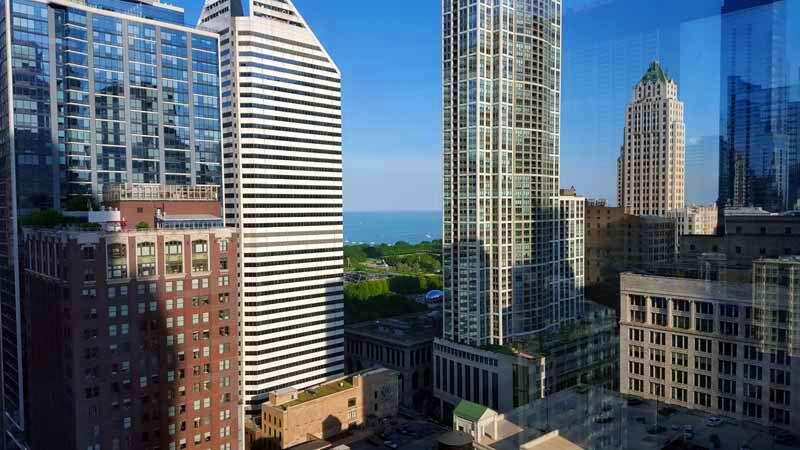 Dine to these views at the Pump Room, up-top the Public Chicago hotel. 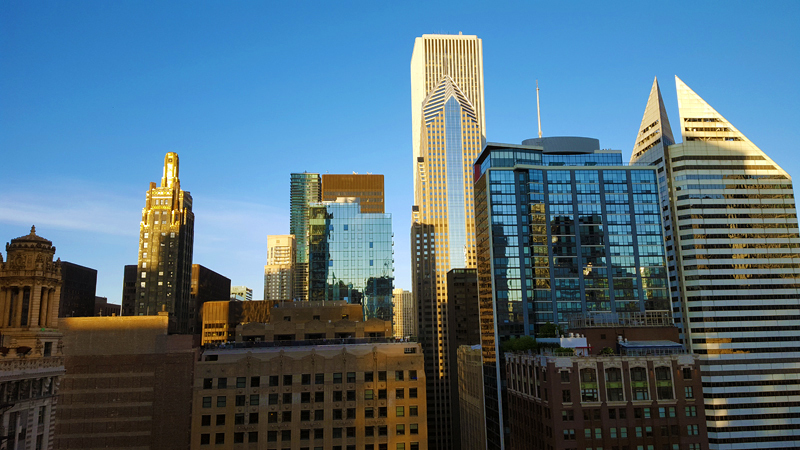 Capture the hustle-and-bustle of Chi-town from the 26th floor and Vertigo Sky Lounge. 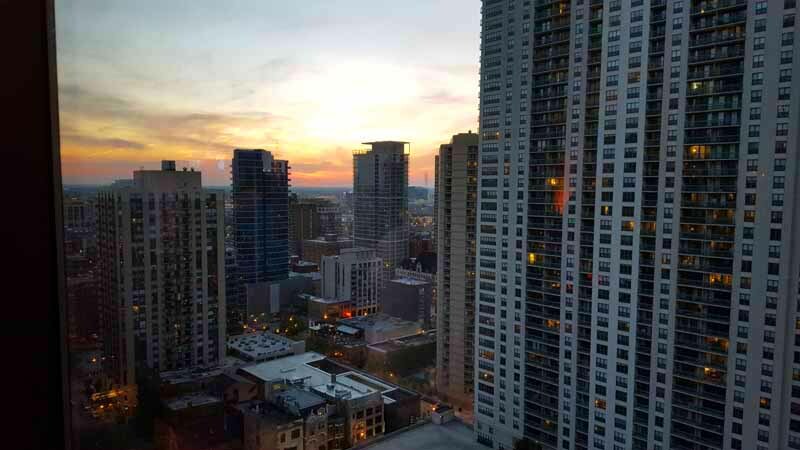 Capture the Windy City at sunset from up-top at Vertigo Sky Lounge. 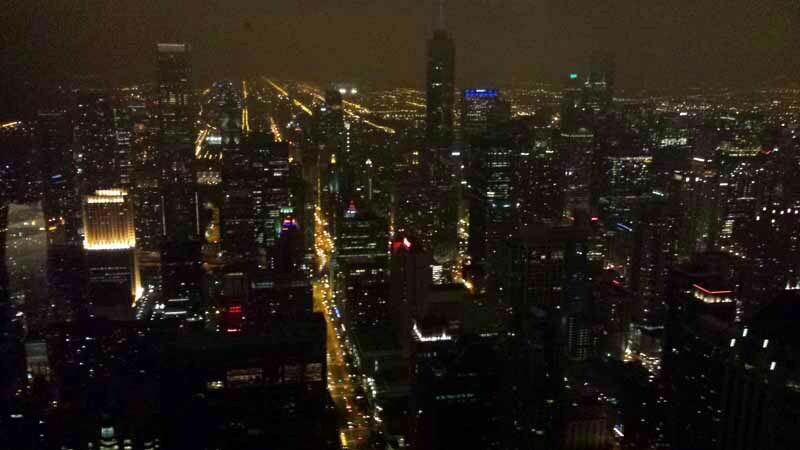 You never known when that next Chicago city shot will present itself, more from up-top Vertigo Sky Lounge. 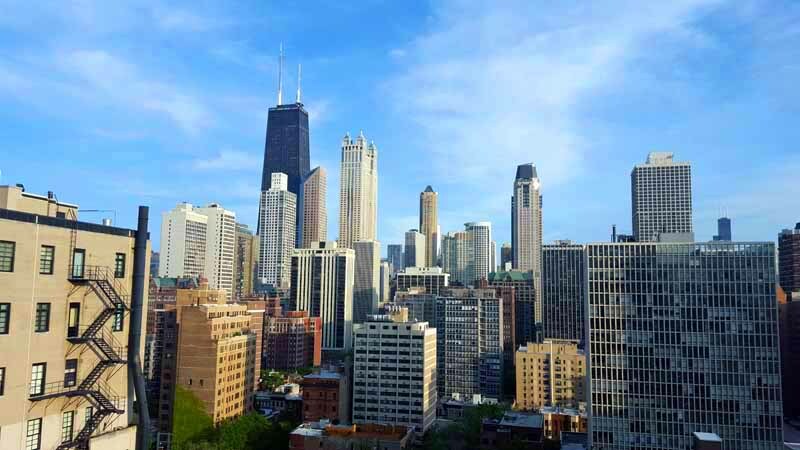 Capture the heart of the Windy City from the 26th floor and Vertigo Sky Lounge. Up-top Vertigo Sky Lounge. You can tell it’s a favorite spot to capture the city. 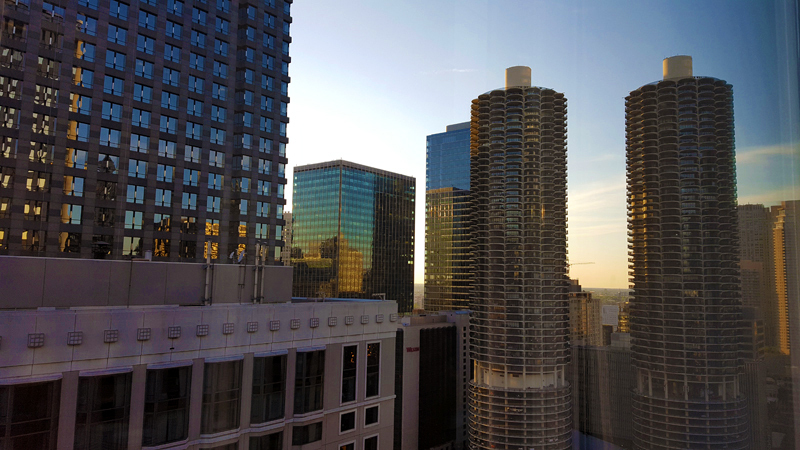 Views looking northward from the Hyatt Regency Chicago. 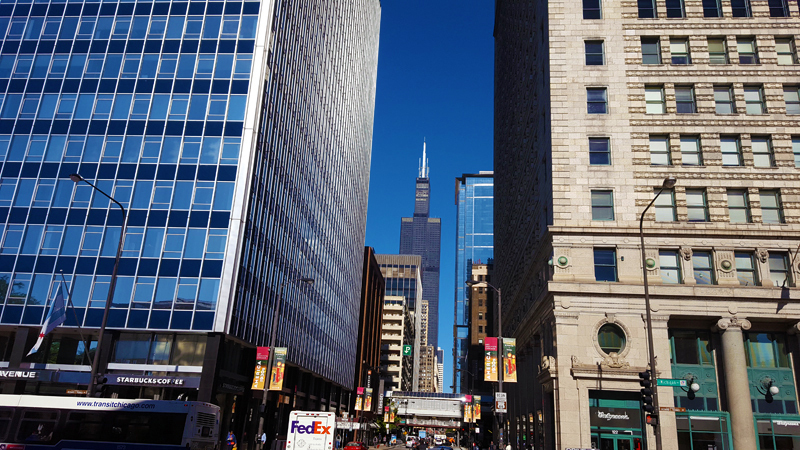 Make sure to look northward when walking along E. Upper Wacker Dr. in the Loop. 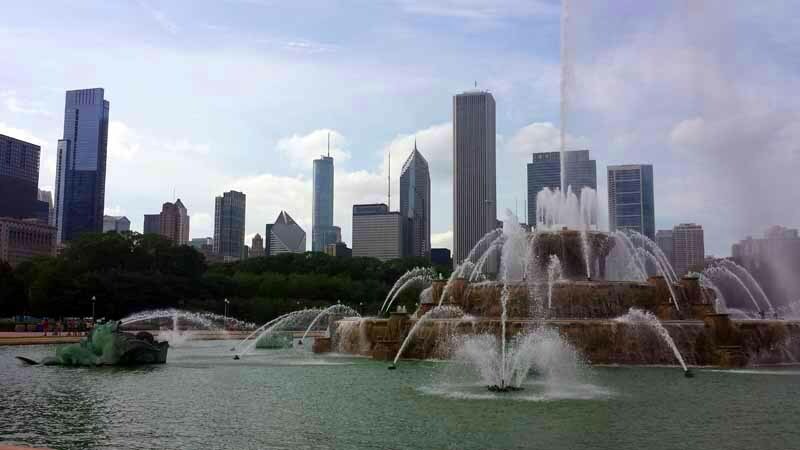 The heart of Chicago sits beyond Buckingham Fountain. 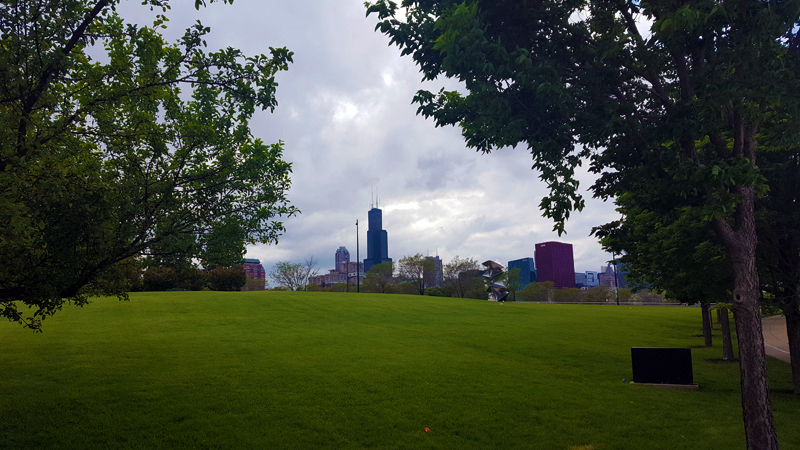 Plenty of skyline views to be had in Grant Park. 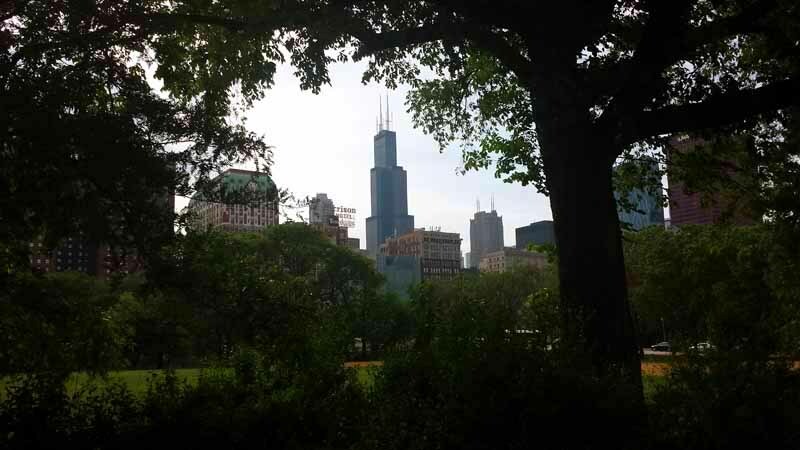 Willis Tower and the skyline are peaking through the trees in Grant Park. 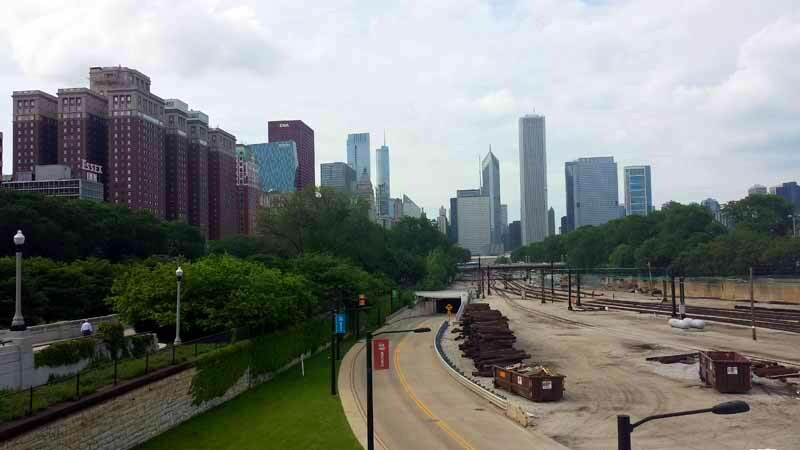 Looking north from a pedestrian bridge in Grant Park. 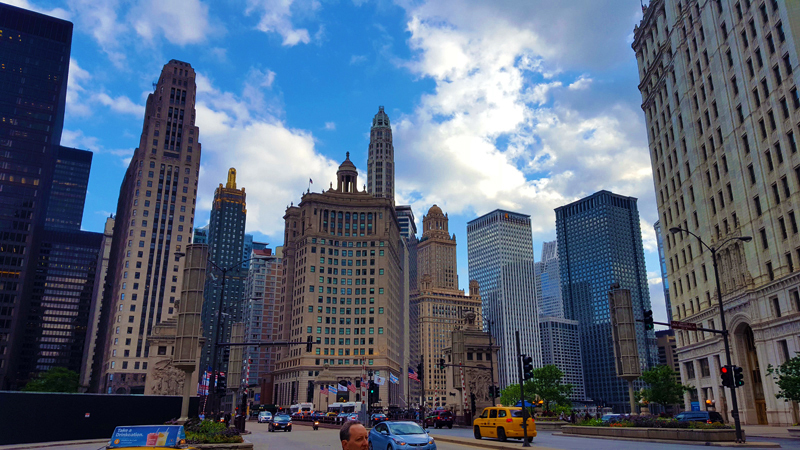 Walking northbound along Michigan Avenue as you are about to cross the Chicago River. 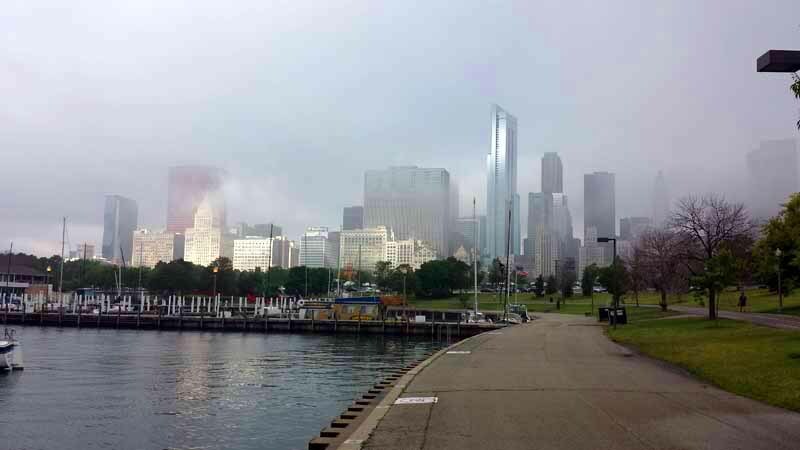 Early morning from the south side of Navy Pier. Night time views up-top the John Hancock building at 360 Chicago. Majestic views up-top the Sears Tower, I mean Willis Tower. 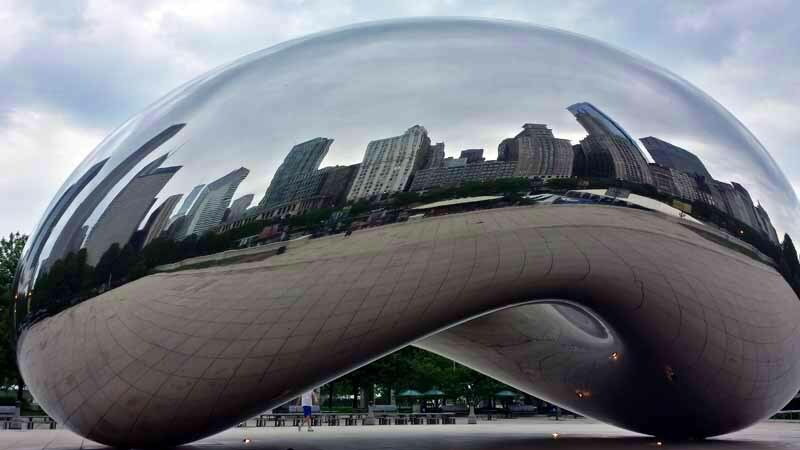 Reflecting on the city at The Bean in Millennium Park. 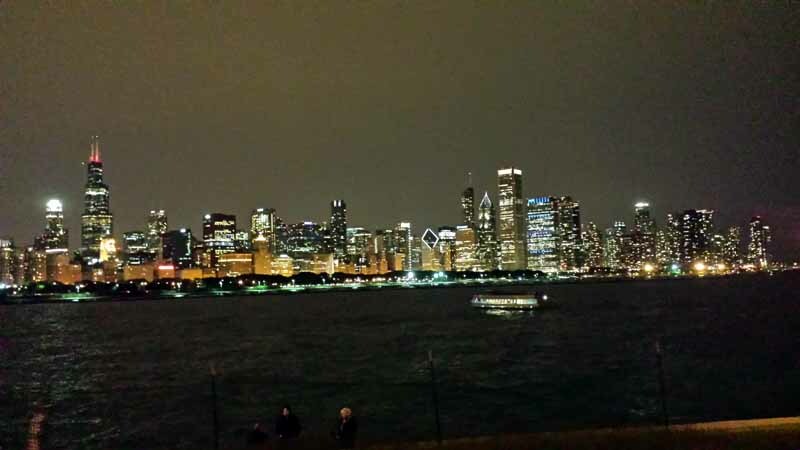 Night time city shot from Lake Michigan. 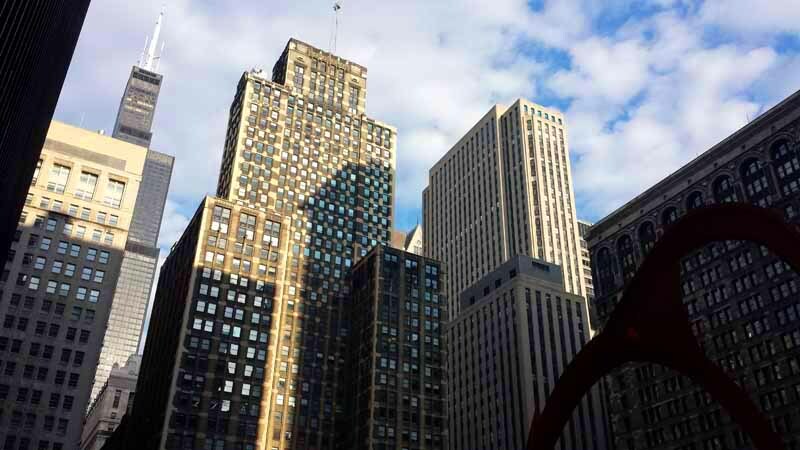 Make sure to always look up when walking in a big city. Random shot while walking the streets. 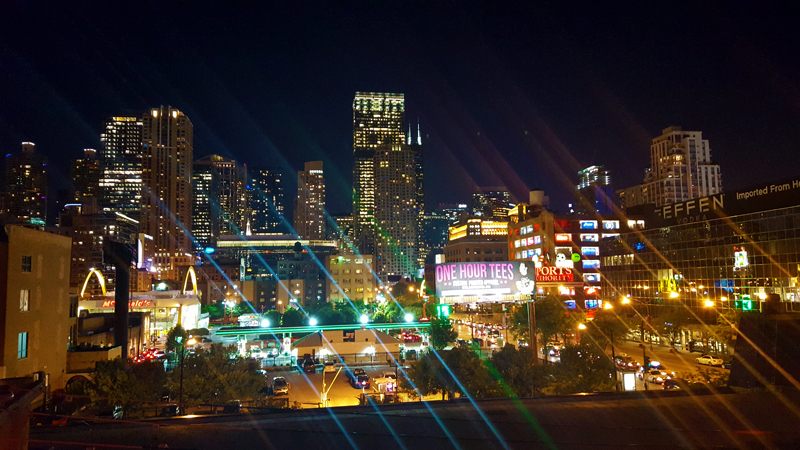 What other spots would recommend for capturing the Chicago skyline and heart of the city?